Somewhere in all of us, there remains an evolutionary precursor. An area yet untamed. It seeps out in strange ways in our everyday lives. It’s so subtle, some people miss it. The fit of laughter you can't control or the feeling of weightlessness biking home from the bar on summer night. It’s your hair in the morning after a night ruled by your dreams. It’s inexplicably wild. There’s wild elsewhere, sure theres wild. And then there’s The Wrangells. Wrangell St. Elias National Park is one of the most remote areas in one of the most remote of the United States. It's closer to Canada and Russia than any other part of the US. At almost three time the size of Denali National Park, any sense of scale blurs. Even the topographic map struggles to make sense of it. Too remote for a round trip helicopter flight, the best way to get there is an artfully piloted bush plane. Alaska has an undeniable allure to adventures of all types. It stretches from the rough sea to the unpredictable sky. Visitors find themselves in everything from ocean kayaks to one-piece down suits. While coveted by many, it is the crown jewel for skiers. Maybe it’s the films we watched as kids or the tall tales from the highest peaks. Maybe we crave the feeling of being on the edge of our abilities. Or more simply, just the feeling of solitude. The reasons are debatable, the draw is not. For me, Alaska was about chasing the unknown. It was about shaking the comfort of the predictable and leaving my desk chair lonely for a spell. I was injecting a strong wind into a doldrum on a pair of skis. Now that the decision was made, it was time to pack. 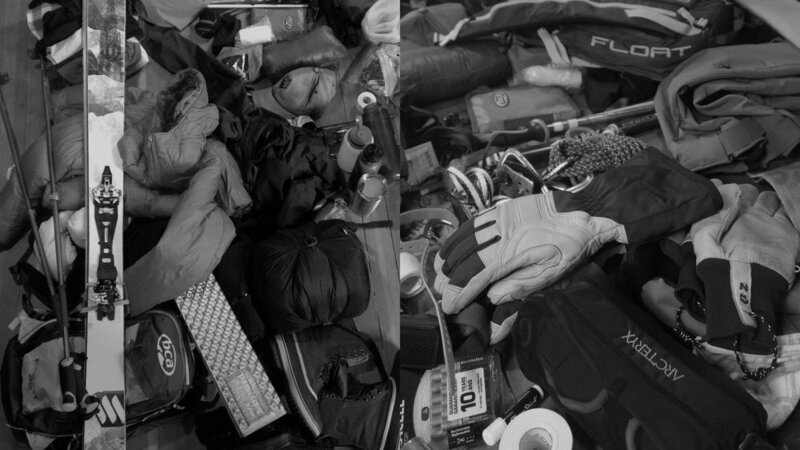 The internet loves measured pictures of gear in preparation for a trip. A neat grid of every possible piece carefully laid out. Plus, the added bits that are far too superfluous to actually bring, but fill the frame nicely. Nobody brings three sets of skis into the backcountry. As for my style of organization? i'm more of a chaotic pile guy. I’m a junk show guy. A frenetic pack and repack, better just double check, “I packed my skins, right?” type of guy. What I lack in organization, I make up for in relentless positivity. And repacking six or so times. My approach to packing extends well into my life. I’m a pile guy, a junk show guy. Two months prior to packing I met Tyler Ried in a chilly yurt in the Cascades for an AIARE Two course. He was one of a pair of overqualified instructors. He stood calmly to the side, arms behind his back, rocking back and forth in shiny boots. Tyler is the type of tough that stays quiet. The tough that never got much satisfaction out of spraying beta or stories of epics. He’s a pro who has built his life in the mountains. He’s the guy who guides the ski films that draw us to these pristine places. Three weeks later, I was flying to Anchorage wondering what the hell I had got myself into. Drew Lovell and Steph Williams round out our guide team. They wear their time in Alaska in stubble and sunglasses tans. Partners in life and the mountains, they spend their springs in Alaska. And seemly always have. I will come to know their partnership as something to aspire to. Their mutual support demonstrated profound respect for each other and the terrain they work in. The Otter met us in a gravel parking lot. Five hours from Anchorage, there’s only so far you can get on roads. At this time of year, Chitina, AK is exactly how far. Legendary bush pilot Paul Claus shut down the engine and kicked open the door of The Otter. Paul is an enigma. He is as wild as the Wrangells themselves, not even gravity knows what to make of him. Far more than a pilot, he is the gatekeeper to this land. And I borrowed a fragile pass. 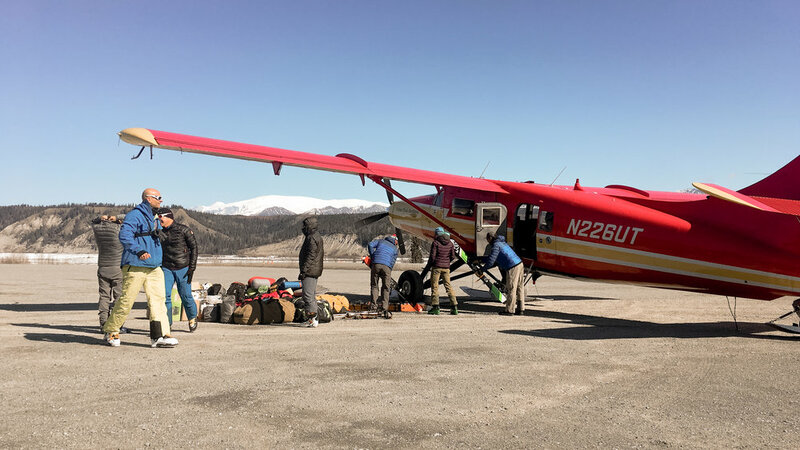 Our skis sat unceremoniously in the dirt while seven strangers and I clumsily fire-lined duffels, ice axes and float packs into the plane. As we flew, paul and tyler decided where we would land. We unloaded the planes and Paul flew back over the horizon. In a miracle of engineering, Paul lowered the Otter’s skids. Our shadow raced up to meet us and we casually touched down. I was dumbfounded. I looked around for a sense of shared awe. Our airplane just landed on the snow, intentionally. But, there was no time -- we were already hustling to work. Paul didn't want to cycle the engine before he took off. Move. Unload. Don’t forget your sleeping bag. Or, god forbid, your skis. Tyler, Drew and Steph transformed when their boots found fresh snow. I watched shoulders relax as hands found the grips of ski poles. Their grins widened as they indulged a brief gaze up at the glaciers. It's clear the Wrangells are home. We made an afternoon’s work of setting up camp so we could get to business the next morning. light faded as we settled in. Home sweet wild home. It was cold, but not cold enough to pay attention to. Restless sleep came and went, until hushed whispers gasped at the stunning glow of the Aurora Borealis. I pulled the buff off my face and wiggled my parka on. I unzipped my -40F sleeping bag, stuffed my feet into cold boots and pulled back the tent fly. It was 3:15a and hushed whispers beckoned anyone awake out of the tent. The snow reflected the sky’s light. Dreamy colors pulsed and danced in slow waves across the sky. Yet Untamed is a celebration of wild places and the beasts you find there. To license content or write for Yet Untamed, inquire here. For more information about skiing in Wrangell - St Elias National Park, Pacific Alpine Guides is the place to go.